Taking standard snap lids off of 5 gallon buckets is extraordinary difficult. I’ve encountered lids that have taken ten minutes and several rest periods to get off. The trick is actually to pull out on the rim rather than up. Several inventions have hit your local bucket outlet to deal with this problem, including the bucket opener pictured to the left. 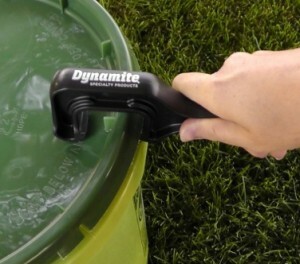 It opens buckets in under a second, and saves your fingertips for another day. Check out our bucket wrench article if it suits your fancy. For a more permanent solution, here’s the Gamma seal lid. It screws on and comes with its own grips to make screwing and unscrewing easier. Gamma seal lids are much easier to open, yet are just as waterproof as your vanilla bucket. Gamma seal lids come in two parts, the rim and the center piece. The rim is affixed permanently to the bucket, with help of a rubber mallet. Gamma seal lids are more expensive than standard lids so it’s best to use them only with buckets that need to be opened and closed regularly. For example, we bake bread every day and keep a bucket of coarse whole wheat handy. With a Gamma lid, the contents stay sealed from bugs and moisture while not taking an immense feat of strength to open. 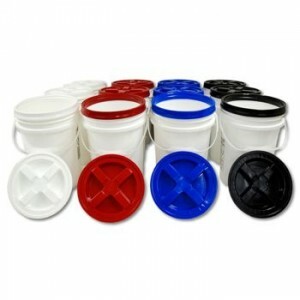 Gamma seal lids are advertised as fitting a “standard-sized” bucket of any capacity as long as the rim is standard. 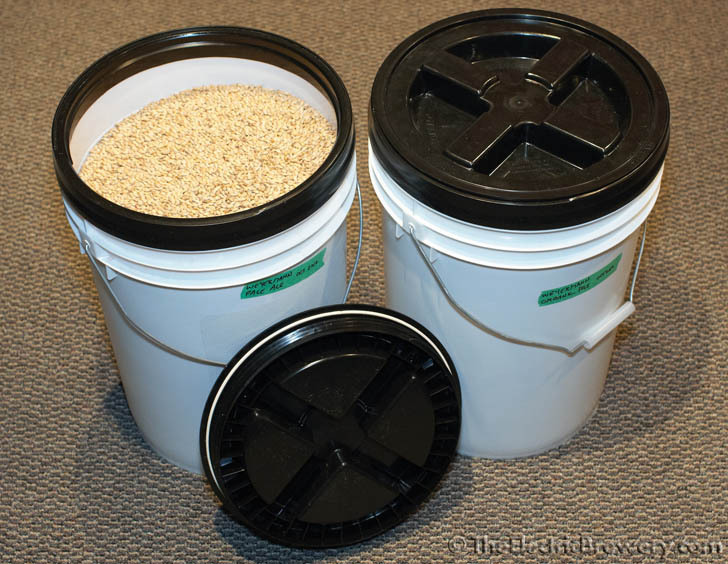 Buckets ranging from 2.5 gallon to 7 gallon all can have the same rim circumference. I’ve found that buckets vary in size, but lids seem to have a bit of flexibility when it comes to fitting on different buckets. When applied to Gamma lids, this is when a rubber mallet comes in handy. This video offers the best demonstration for securing and removing a Gamma Seal Lid. Makes you feel like a DJ spinning a record! For details, reviews and purchase options, see Amazon. Have you ever had problems with the gamma lids leaking? I got one and tested it by putting some water in the bucket, sealing it, and turning it upside down; and it leaked. It was slow enough that I was still able to use it for work (storing tubes of caulking made with cardboard), but I nervous about using for long term with food. I wonder if this happens because your bucket is slightly larger or smaller than what the gamma lid is designed for. You can only design for one exact bucket dimension although there are many slightly different dimensions of buckets in the wild. Can the rim be taken off of a bucket for re-use on a different bucket? The orginal bucket is degrading and I wanted to be able to re-use the spin-on lid. Yes, the gamma lid ring can be taken off, albeit not easily. Do buckets still nest with the Gamma Seal rings attached to the buckets? sorry, not a chance. The inner seal will completely block another bucket from nesting. You should still be able to stack them somewhat though. here’s How I fixed 5 gallon Bucket NOT to leak Before you add a GAMMA SEAL. 2.the Gamma seal ring same thing -where it is put together Small inperfections. .3. same thing with the actual screw down lid.small IN perfections when they make it. 4.look at the gasket I have several that were BAD where they are put together-a slight file on them—add a Very light amount Vasoline—None of mine leaked after all this. fine Grit— fingernail file, sorry. thank you. do you think it would work after I’ve already put the ring on? can I take it off and try again? Gamma lids are great until the bucket cracks and/or leaks. You can’t transfer the gamma lid to another bucket. Actually they do come off. Take a 1 x 4 ” plank about 2 foot long. Place the bucket on the ground on its side. Put the end of the plank at the bottom edge of the seal ring. Using a big rubber mallet strike the other end of the plank. Rotate the bucket a quarter turn and repeat, once or twice.